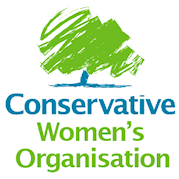 The Conservative Women's Organisation celebrated its 90th anniversay in 2009, making it the oldest women's political organisation in the world. By the early 1990's the CWO had more than a quarter of a million members and became the largest women's political organisation in the Western world. It should not be forgotten that the first woman MP in the House of Commons was a Conservative as well as the first woman Prime Minister in the UK. Women on the Conservative benches in the House of Commons still remain under-represented - the 2005 election returned only 17 women MPs - 9% of the Parliamentary Party. The 2010 election improved this by returning a 250% increase in women MPs on the Conservative benches (49), however, they still only represent 16% of the party. We remain dedicated to enabling more women to become elected as Members of Parliament. The CWO pays tribute to all those women who, over the years, have played such an enormous part in securing the right to vote, campaigning for women's rights and contributing to and shaping the present day Conservative Party. If you would like to get involved with the Conservative Women's Organisation here in the Aldershot Constituency, please contact our office on 01252 323637. Copyright 2019 Aldershot Conservatives. All rights reserved.